Are you looking to find the best cleaning service cost, with a focus on floors? Do you need occasional floor cleaning with a machine but you don’t need it every day, and you’re wondering if you can find a service that offers various packages to suit your unique needs? Depending on the flooring you have, you could be seeing dirt and scuffs appear even after a short period of time, and this is especially true if you have a large space and a lot of staff. Minimizing floor imperfections isn’t only important for the sake of aesthetics and sanitation – it can also be a safety issue. Floors that are too slippery when wet, for instance, could cause you a lawsuit. Hiring a professional floor cleaning service takes the stress out of this sometimes complicated and energy-consuming task. If you’re considering hiring a professional cleaning service, read on for more information. On hard flooring, wear and tear can also appear like dirt, so it’s important to keep them clean in the interest of appearances. Your floor will need specific care depending on the material and the size of the area. Floor cleaning strategies will vary depending on whether your floors are made of Marmoleum, vinyl, tile, terrazzo, marble, or another type of material. Professional cleaners will know precisely how to clean and treat different types of flooring. Tile typically requires a floor scrubber to get the dirt out from between the small crevices between tiles. Then they may also need different types of maintenance such as using a special protectant to ensure longevity. This kind of high-grade protector and cleaning systems work much better than anything you could do by hand and can get even the most difficult bits and pieces out of tiled areas. For larger floors made of linoleum or vinyl, you’ll also want to consider scheduling regular buffing and waxing. Many hard floors, for instance, can be damaged by brooms which is why special equipment is essential to keep them clean. Wood floors can be difficult and delicate as well, and professional cleaners will always have a special wood floor cleaning program. Professional cleaners will come equipped with floor cleaning machines which are indispensable, particularly when it comes to large spaces. They will use industrial floor scrubbers to keep your floors both well-cleaned and in like-new condition. 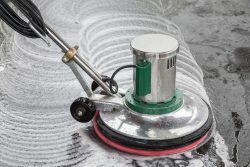 These machines can cover large amounts of space in short periods of time and thus should be considered over a “mop-and-bucket” type of cleaning for larger buildings. They will also have options for carpet cleaning that are much more substantial and effective than a single-hand vacuum. These powerful devices are essential for minimizing not only dirt but also allergens in carpeted areas. The costs of floor cleaning will depend on the size of the area, the frequency that it is required, and the specialized equipment needed. Typically, if you contact a professional cleaning company, they’ll offer the option of stripping, waxing, sealing, and buffing. The cost will depend on square footage and all services chosen. JAN-PRO is a top-rated Canadian cleaning company that is committed to ensuring the highest quality cleaning and maintenance standards when it comes to keeping your floors in tip-top shape. Our regular cleaning packages start at $225 a month. Are you looking for more information on professional floor cleaning services? Don’t hesitate to call us today and get a free quote.